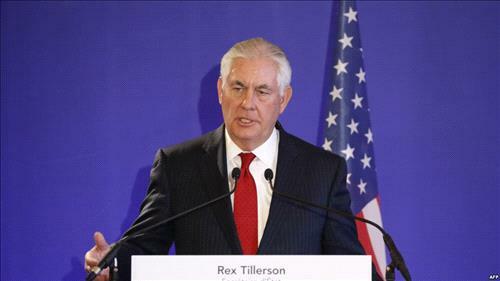 AMMONNEWS - U.S. Secretary of State Rex Tillerson is scheduled to visit Jordan on Wednesday, according to official sources. Tillerson's visit to the Kingdom is part of a regional tour that also covers Egypt, Turkey, Lebanon and Kuwait. In Jordan, Tillerson will hold talks with top officials and "will underscore the enduring strength of the US-Jordan relationship, engage with the Jordanian leadership on the conclusion of a new Memorandum of Understanding on bilateral assistance, and discuss key regional issues such as the ongoing crisis in Syria and Jordan’s support for Middle East peace, according to a recent statement by the US embassy in Amman. In Turkey, the US official will meet with senior officials to discuss a range of bilateral and regional issues. He will also lead the U.S. delegation to the ministerial meeting of the Global Coalition to Defeat Daesh to be hosted by Kuwait.